The power goes out on 9-1-1 Season 2 Episode 14, leaving the call center blind and the first responders out cruising the streets. Read on for the review! Athena and Buck team up to search for Maddie on 9-1-1 Season 2 Episode 13, while Chimney's fate is revealed. Read on for the full review. Have you wondered how Chimney got to Station 118? Well, 9-1-1 Season 2 Episode 12 gave us a glimpse into Chinney's life during his early days at the station. Read on! It's Christmas time in LA on 9-1-1 Season 2 Episode 10 and the first responders deal with a series of bizarre instances at work and personal drama at home. Hen's backstory is shaded in on 9-1-1 Season 2 Episode 9, as we see how she got her start at Station 118. Read on for the full review of an inspiring hour of television! Buck is ready to start dating on 9-1-1 Season 2 Episode 8, while the first responders deal with emergencies involving couples in various stages of love. Read on! It's Halloween time and the first responders deal with a litany of calls, while Hen is tasked with making a life-altering decision on 9-1-1 Season 2 Episode 7. Station 118 is the subject of a news story on 9-1-1 Season 2 Episode 6, but not everyone is eager to be on camera. Read on for the full review! Maddie joins Athena on the road for an unforgettable ride around Los Angeles, while Hen deals with an unexpected visitor on 9-1-1 Season 2 Episode 5. Read on! The first responders deal with assorted personal issues on 9-1-1 Season 2 Episode 4, while also dealing with a host of precarious emergencies. Read on for the review! 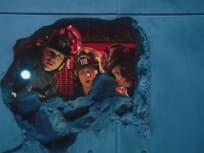 The first responders continue to deal with the aftermath from the earthquake on 9-1-1 Season 2 Episode 3, as survivors continue to be found and aftershocks loom. Read on!